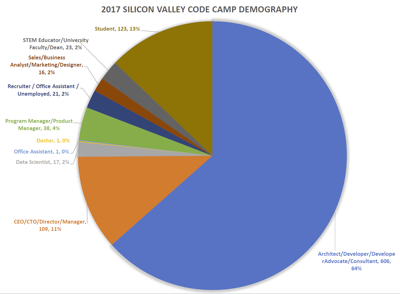 SVCC News - 2 Days Before Silicon Valley Code Camp, A Few Tickets Left! 2 Days Before Silicon Valley Code Camp, A Few Tickets Left! Buy your one or two day ticket now and you can still get an official badge and get 35% off! We still may have full price tickets on Saturday and Sunday but who knows. We are close to capacity. One of the best reasons to come to code camp is networking. Ever wonder who you will meet? Checkout the pie chart below. For example, last year, 11% self identified as CEO/CTO/Director or Manager. 64% as Architect/Developer/Consultant. It's an awesome group of people. We purposely have longer than most conference times between sessions to encourage networking.